Here we are at the final #thebookclubcookbookCC event. Final. Can you believe it?? It's hard to fathom that our year-long journey to explore - and cook from - The Book Club Cookbook, Revised Edition: Recipes and Food for Thought from Your Book Club's Favorite Books and Authors by Judy Gelman and Vicki Levy Krupp* is drawing to a close. Judy, Vicki, and their publisher, Tarcher-Penguin, provided the hosting bloggers with copies of the book plus copies to giveaway each month of the project. We are so grateful for their generosity over the past year. This month I have selected Corelli's Mandolin by Louis de Bernières. The book was also made into a movie, starring Nicholas Cage and Penelope Cruz. I highly recommend both the book and the movie. ** The Book Club Cookbook includes a recipe for Spankopita which I am sharing below, but feel free to cook anything that intrigues you be it something Greek or Italian. 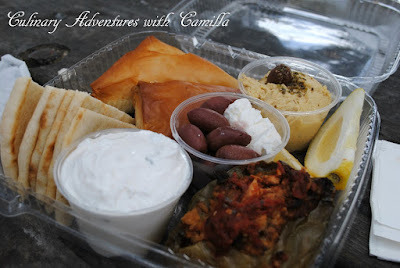 I, myself, might just have to make an entire tray of mezedakia (Greek snacks) for this event! 1. Draw inspiration from the chosen recipe(s). 3. Include a link back to the hosting blog (that's me!) - Culinary Adventures with Camilla - somewhere in your post. 4. Include a link back to this invitation. 5. Your post must be current (during July 2016). And, of course,we don't mind if your post is linked to other events. The more, the merrier. Deadline for submission is: Friday, July 29th. Watch for the roundup to be posted shortly after this deadline...along with the winner of the cookbook. Thaw the spinach and drain in a colander. Taking a handful of spinach at a time, squeeze out all moisture. Roll spinach in a clean dish towel and wring dry. Place in a large bowl. Chop the green and white parts of scallions separately. Melt 2 T of butter in a skillet and saute the scallion whites until soft, approximately 5 minutes. Remove from heat and stir in scallion greens. Add to the spinach along with the feta and cottage cheese. In a separate bowl, using an electric mixer at medium speed, beat the eggs briefly. Add the cream cheese and continue to beat until smooth. Add to spinach mixture. Stir in 3 T melted butter. Add salt and pepper to taste (take care with the salt as feta cheeses vary in their saltiness). Prepare a clean work surface. Keep a bowl of melted butter handy at all times. Cut the phyllo lengthwise into 3 equal strips, approximately 3" wide. While making the spanakopita, always keep the phyllo covered with plastic wrap or damp dishcloth to prevent drying. Remove one strip of phyllo, place on work surface, and brush well with butter, using a pastry brush. Place a teaspoon of filling near the bottom of the strop and fold one corner up to meet the opposite edge, making a triangle. Continue to fold the triangle, edge over edge like a flag, to the end of the strip. Place seam-side down on a sheet of aluminum foil. Repeat this process with remaining phyllo strips. Nestle finished spanakopita together in squares. As you fill a sheet of foil, brush the tops of the spanakopitas with butter and cover with another sheet of foil. Spanakopitas may be prepared ahead of time and refrigerated or frozen until ready to cook. Place spanakopitas on an ungreased baking sheet and bake 20 to 25 minutes, until puffy and golden. Serve warm. 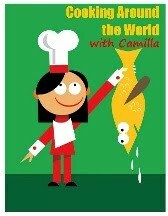 This month Camilla at Culinary Adventures with Camilla, this month's host, is giving away two copies of the book. * Enter to win a copy of the cookbook! TWO of our lucky readers - US and Canada only! 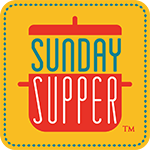 - can enter to win a copy of The Book Club Cookbook, Revised Edition: Recipes and Food for Thought from Your Book Club's Favorite Books and Authors by Judy Gelman and Vicki Levy Krupp, courtesy of Tarcher-Penguin. Giveaway runs from July 1st till July 31st at 6 o'clock PM, Pacific time. Please see terms and conditions in the rafflecopter widget below. Many thanks to Tarcher Books. You may find Tarcher: on the web, on Facebook, on Twitter, and on Pinterest. *Disclosure: Camilla received a complimentary copy of The Book Club Cookbook, Revised Edition: Recipes and Food for Thought from Your Book Club's Favorite Books and Authors by Judy Gelman and Vicki Levy Krupp as an opportunity to give two copies away. Opinions are our own. We received no further compensation for our posts. **This blog currently has a partnership with Amazon.com in their affiliate program, which gives me a small percentage of sales if you buy a product through a link on my blog. It doesn't cost you anything more. If you are uncomfortable with this, feel free to go directly to Amazon.com and search for the item of your choice. I am looking forward to this month's selection! Greek food is always a hit in my house, so I can't wait to see what culinary inspiration I take from reading. Thanks Camilla. So sorry to see this fun come to an end.